If you have a blurry or unclear vision at both near and far distances, you might have astigmatism, a type of refractive vision problem that occurs when your cornea - the clear covering over your pupil and iris - isn’t perfectly round (it’s more oblong, like a flattened football). Most people have some degree of astigmatism (after all, in nature, a perfectly round cornea is pretty rare), but for many people, any aberration in corneal shape is so small, they won’t even notice it. For others, though, the aberration can interfere with the way light behaves when it enters the eye, causing blurry vision at all distances. That’s astigmatism, and it requires a special style contact lens (called a toric contact lens) to correct blurriness so you can enjoy clear vision. Eye Site is a top provider of contacts for astigmatism for patients in Houston and Katy. Read on to learn more about these special lenses, then call the office to schedule an exam and lens fitting so you can start enjoying clearer vision. While standard contact lenses are round, toric lenses feature a slightly different design - more oblong in shape. This different shape causes light to be bent in different ways, creating different focusing powers both horizontally and vertically. The changes in focusing power are gradual and extend around the lens. It sounds confusing, but basically, a toric lens design is shaped in such a way that it can correct the refractive errors caused by an oblong cornea. Why Does Astigmatism Require Special Lenses? FIrst, let’s think about how light focuses inside your eye to create images. In an eye with a perfectly round cornea, light enters the eye and travels to the light-sensitive cornea at the back of the eye where it comes together to create a clear, focused image. In a perfectly round cornea, light that enters the cornea from any direction and on any part of the cornea is refracted in a predictable way, both horizontally and vertically. That means you can see objects clearly, without fuzzy edges or other distortions. But if the cornea is more oblong in shape, light entering the eye will be refracted differently, depending on where it passes through the cornea. And that means you’ll experience fuzzy or blurry vision as a result of these differences in refraction. Of course, even if you have a round cornea, you can still have vision problems. Again, in an ideal cornea that’s perfectly shaped, light is refracted by the cornea and comes together to focus on the light-sensitive retina at the back of your eye. But if the cornea is too flat or too steep, the light that enters the eye will become focused either in front of the retina or behind it. People who have astigmatism can also be nearsighted (myopic) or farsighted (hyperopic), making vision correction all the more challenging. 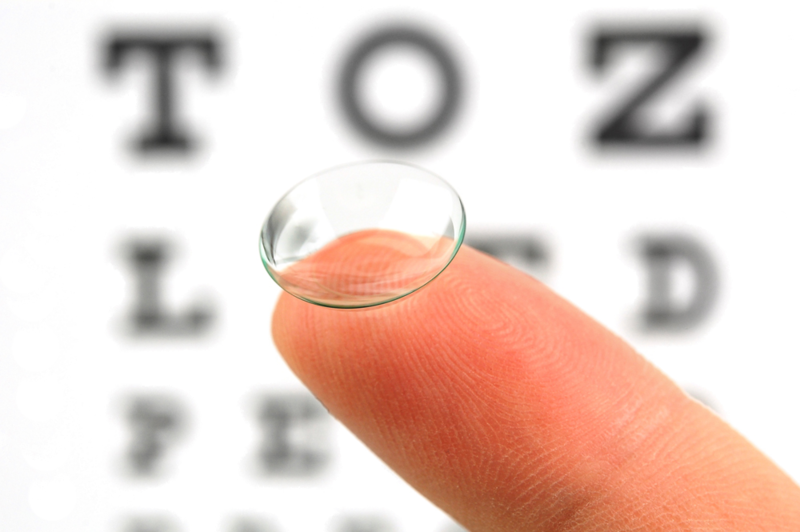 Fortunately, toric contact lenses can be designed to address myopia and hyperopia in addition to astigmatism. Like other types of contact lenses, contacts for astigmatism also come in different “types.” In addition to lenses that correct refractive errors like myopia and hyperopia, toric contact lenses are available in daily lenses (lenses that are worn for one day and then discarded) and other disposable styles, including lenses you can wear every day for a month before throwing them away. Plus, like other types of contact lenses, toric contact lenses are available in tinted or colored versions too. Toric lenses are available in soft, rigid and rigid gas permeable (RGP contact lenses), a style that combines the best features of both soft and hard lenses, including a comfortable design and improved focusing power for fine details. Many people with astigmatism who aren’t satisfied with their hard or soft lenses may find RGP lenses are just what they’re looking for. Your eye doctor will review these options during your visit so you can select the best lenses for your needs. As a top eye care provider in Houston and Katy, TX, Eye Site is committed to helping every patient find the ideal solution for their vision needs. We carry the most popular brands of contact lenses, including Acuvue, Air Optix, Alcon, Bausch + Lomb, Bioinfinity, CooperVision, Proclear, Duette and CIBA Vision. If you’ve been thinking about contact lenses or if you’d like to try a different style of lens, we can help. Call Eye Site’s Houston location at 713-984-9144 or our Katy office at 281-644-2010 to schedule an office visit today.